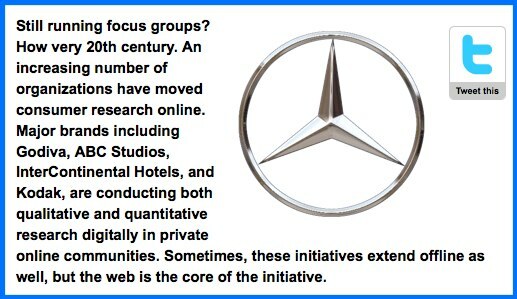 Follow this link to a good blog post from Econsultancy on how Mercedes has set up two online communities to get closer to existing and prospective owners. An increasing number of companies are doing this, recognizing that engaging with consumers in an informal, social online setting encourages spontaneous and open discussion, yielding a truer picture of people’s thoughts, feelings, opinions and ideas than more “lab-like” techniques like focus groups and surveys. The result is that you obtain perspectives and insights based on what consumers feel is important rather than merely what the marketer is trying to find out. Community members also feel recognized and appreciate the fact that the company is really listening, which helps to drive brand advocacy. I just received the first 10 chapters of J.C. Hutchins newly published thriller, The 7th Son: Descent, in a free, down-loadable “special edition” pdf. It was sent to me courtesy of CC Chapman’s podcast Managing the Gray. I say newly published, because the novel has been around for awhile. Hutchins originally released it as a serialized podcast, also for free. From those humble beginnings the story’s fan base spread through online word-of-mouth until it eventually caught the attention of a “real” publisher, St. Martin’s Press. It is “now in bookstores everywhere,” as they say. Hutchins’ web site, J.C. Hutchins Thriller Novelist, is highly interactive, providing links and downloads, updating fans on the novel’s progress — e.g. Amazon ratings, recent reviews and the like — and even has a section called “evangelize,” where fans will soon find tools for spreading further world of mouth. It’s a wonderful case study in how online social connections can build a groundswell of support for an aspiring novelist’s work that eventually leads to publication by a recognized institution of the trade with access to an even wider audience. Interesting that despite everyone talking about the democratization of content and the wisdom of the crowd, the ultimate “legitimization” of a work of fiction, or for that matter non-fiction, still seems to be if it is picked up by an “old media” publisher and gets reviewed by the likes of The New York Times and Publishers Weekly. Why is that? Deep down inside, do we still rely on the official arbiters of literature to tell us if something is good or not? Despite the fact that Hutchins can now earn money on his work in book form, he continues to offer it for free as a podcast or pdf. I admire his generosity and idealism, and I hope, for the sake of his bank account, that there will be enough readers who are willing to spend $14,99 to read the novel in what for many is still the most enjoyable format of all, words on a printed page between two covers of a book. Sometimes I get the feeling that Charlene Li is on a crusade — a crusade to prove with hard data that social media can have real value for business. First there was Groundswell, co-authored with Josh Bernoff, which highlighted an array of companies leveraging social media successfully to achieve business objectives. Now there’s a new study from Charlene’s company, Altimeter Group, and Wetpaint, that shows a correlation between social media engagement and financial performance. The ENGAGEMENTdb Report looks at the top 100 performing global brands according to the BusinessWeek/Interbrand “Best Global Brands 2008” ranking and measures and ranks their engagement in a range of social media channels for both depth and breadth. The analysis shows a clear correlation between social media engagement and financial performance. While correlation is not the same thing as cause and effect, the data is impressive. And as Mark Pack points out in a blog post, if one assumes that the world’s top performing companies are run by the world’s most capable managers, it’s noteworthy that these business leaders appear to endorse a deep and committed engagement in social media. The report concludes with a useful assessment of the best practices of four of the most socially engaged brands — Starbucks, Toyota, SAP and Dell. It’s interesting that the way companies engage in the space can vary greatly. For example, while Starbucks only permits a small group of designated employees to speak for the company in social channels, SAP has 1500 employee bloggers. There are a few details missing from the report that I would like to have seen. Each company was rated on 40 engagement attributes, but the report doesn’t provide the specific attributes. What’s more, while it lists the specific social media channels analyzed, there is no analysis of which, or in what depth, each company engaged with the individual channels. This might have helped to better understand while Apple, a company that doesn’t receive particularly high marks from me for online social engagement, made it to the top third of the ranking. So, what will be the next station in Charlene Li’s crusade to prove the business value of social media? I wouldn’t be surprised if she’s already working on the next quantitative study, the one that show not only a correlation, but an actual cause-and-effect relationship between social media engagement and business results. Josh Bernoff of Forrester Research, co-author with Charlene Li of the groundbreaking social media study Groundswell, recently issued a Forrester report entitled The Growth of Social Technology Adoption. I came across the link on ReadWriteWeb. Delighted at the chance to download my copy, I went straight to the site, where I was stopped dead in my tracks. Unfortunately, all I got to read was the synopsis, because the full report costs $279. Now I don’t want to appear cheap or ungrateful. Josh, Charlene and Forrester have been quite generous in sharing their social media knowledge. For example, you can go to the Groundswell web site and create, free of charge, a basic Social Technographics profile for a demographic and geography of your choice. I also recognize that Forrester Research is a business, and businesses need to make money. Still, social media is in its infancy. And many of its standard bearers, bloggers like me, promote the cause on their own time and with their own finances. Sure, I have a day job in marketing and communications, but my forays into social media are not an official part of that job — yet. I’m working to change that, and one of the ways is by constantly deepening my understanding of social media and slowly but surely bringing that knowledge to bear on the work I do for my employer and our clients. But for now, whatever resources I leverage to build my knowledge base, if they involve a monetary cost, I fund out of my own pocket. And $279 is a bit steep for my budget. So here’s my request to Forrester. How about a special rate for independent social media proponents like myself? Google provides many services — Google Analytics for starters — free of charge. They recognize that by helping marketers to learn how to use online advertising more effectively, it will ultimately help Google’s business. In the same way, if Forrester helps me to nurture my expertise of the social media space, that should pay off in the long term for Forrester. I will be better able to show my clients the value of social media for their business, get them started in the space and eventually purchase Forrester reports, tools and services that help them engage successfully. Or how about a discount for people who bought Groundswell? (I’m sure I still have that Amazon receipt somewhere.) Or for writing a review of the book on a blog? And if all of this doesn’t move you, Forrester, how about just getting into the Christmas spirit? I’ve been a good boy all year — especially as a standard bearer for social media. I hope when Santa comes down my chimney this year, he’s got something in his sack from Forrester. My mother will turn 85 this coming December 26th. This year, when I visit her and my dad for the holidays, she’d like me to show her “these new things on the internet” that she’s been hearing about. What she’s been hearing about — and not just from me — are the communities and online social tools that have become integrated into the lives of many of us. Facebook, MySpace, Twitter, etc. She’s not sure which ones might be right for her, but she’s curious and wants me to help her understand them. Despite her age, my mother is comfortable with the computer, uses email and knows how to set up a video conference on iChat. She also enjoys simple computer games. She loves to be in touch with friends and family, but isn’t able to get around as much as she used to. For older people like my mother, social media can be a godsend against isolation, a way to stay connected to the wider world and to socialize. Josh Bernof, one of the co-authors of the book Groundswell and analyst at Forrester Research, recently wrote about the rapid growth of adaption of social media in 2008. Not surprisingly, much of it is coming from older onliners. Whereby he defines “older” as 35-44 year old’s. (And I thought 40 was the new 30.) But even among Americans aged 55 and up who are online, only 38% are what Bernhof calls “inactives” — people who don’t even passively use social media (e.g. never ever read, say, a blog, much less leave a comment or subscribe to one). I say not suprisingly because the greatest potential for social media growth will come from that great white space of older, later adopters, who still have yet to get their feet wet. But have every reason to do so. Like my mom.